Finding room in the office refrigerator can be like a game of Tetris combined with the Battle of Five Armies in Lord of the Rings—but refrigerator style. Whether you want to avoid the office refrigerator battle royale or send your kids to school with something that’s a bit more interesting than PB&J, here are five delicious, simple lunches that don’t require refrigeration. This sandwich takes only eight minutes to prepare once you have the ingredients assembled, and it’s delicious and healthy. 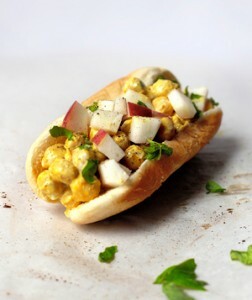 The tangy Greek yogurt, chikpeas, and spices make the sandwich delicious and Indian inspired, while the apples add a crunch and sweetness. Get the recipe at Real Simple. While this might be a little complex for your kids’ school lunch, it’s great for the office. Combine everything in the recipe before you leave for work, and just bring a can of tuna to add just before you eat. Find the recipe at Columbus Parent or at Eating Well. 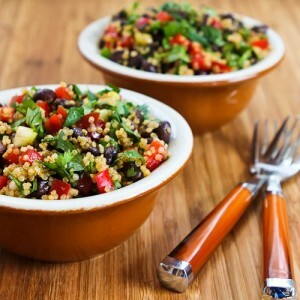 This southwestern-inspired salad features black beans, red bell peppers, cilantro, green onions, and an awesome chili-lime dressing. The recipe only really requires chopping vegetables, boiling the quinoa, mixing the dressing and BAM—you’re done! 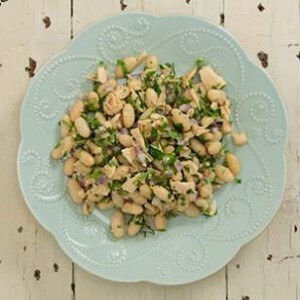 This is a great recipe to make in bulk so that you can eat off of it for a few days. Find the recipe at Kalyn’s Kitchen. 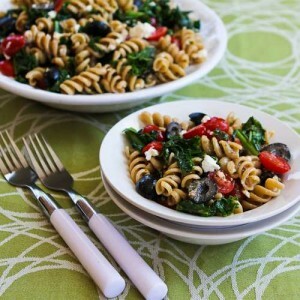 This recipe calls for whole wheat pasta (but you can substitute in whatever you like best), fried kale, tomatoes, olives, and feta cheese, all topped with a pesto vinaigrette dressing. The pasta is light and healthy, but the blogger behind the recipe calls it “more of a main dish than some pasta salads.” And it’s just so darn colorful! Get the recipe at Kalyn’s Kitchen. 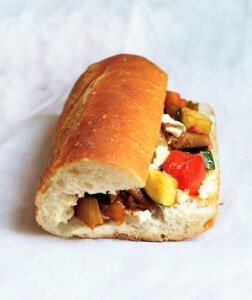 Fill a crunchy baguette with creamy goat cheese and a pile of veggies that you’ve sauteed before hand and seasoned with paprika. You could even bring yourself a small can of microwaveable tomato soup to go with it.